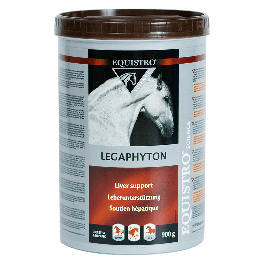 Equistro Legaphyton is a dietetic feed supplement designed to support liver function in cases of chronic liver insufficiency in horses. Equistro Legaphyton is a pelleted dietetic feed supplement designed to support liver function in cases of chronic liver insufficiency, such as horses under intense training, overfed or aging horses. Before being released on the market, every Equistro Legaphyton batch is analysed for environmental contaminant, ensuring that the product does not contain ingredients likely to make a positive doping test. What are the benefits of using Equistro Legaphyton? What is in Equistro Legaphyton? Barley flour, Carob pod 25%, Lucerne 15%, Sucrose, Pregelatinized potato starch, Silibin/phospholipids 3% (Silibin 1.1% and phosphatidyl choline). Source of proteins and fibres: Cellulose, Silibin/phospholipids. Additives/Kg: Thickening and stabiliser agents: cellulose E 460 (ii) 40000 mg.
How do I use Equistro Legaphyton? Horses (500 kg): 30 g (1 scoop) per day. Ponies: 15 g (½ scoop) per day. To be mixed with a high quality protein feed which should be divided into several small meals per day. Advised period of feeding is for an initial period of up to 6 months. Is there any further advice I should know about Equistro Legaphyton? It is recommended that a veterinarian‘s opinion be sought before use or before extending the period of use.